Everyone participated. Jenny Lee & Megan McClure handled the write-ups. Happy 2018, happy hour enthusiasts! It's been a while since we told you about our latest Happy Hourians haunts so we thought we'd share a few of our favorites from the last part of 2017. If you haven’t been to The Rieger yet, you’ve probably heard of it - maybe while asking someone for a good date/anniversary dinner spot. 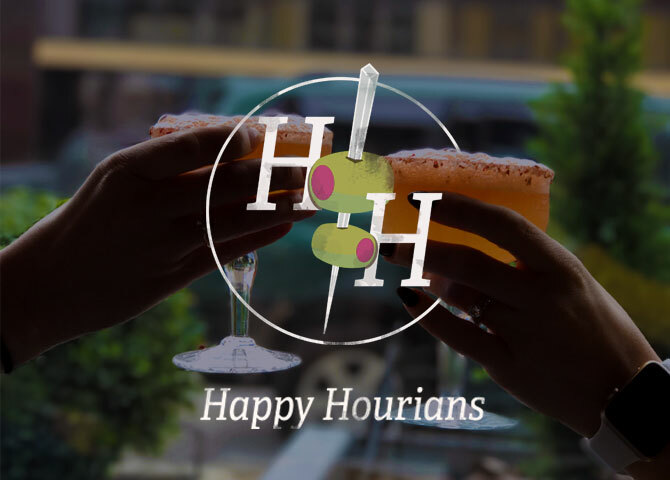 What doesn’t often get mentioned is the fact that they have amazing happy hour deals Monday through Friday from 3 – 6pm. The small yet mighty drink list has all of the right things that will make everyone in your happy hour group, seriously, very happy. Just make sure you carve out enough time, because with its carefully curated happy hour drink offerings and seasonal snacks and small plates, you may end up staying a little longer than you had originally anticipated. We recommend: All of their cocktails are simple and delicious. We fell in love with the French 75 that day, but recommend choosing a cocktail based on your choice of liquor! Also, if you’re feeling a little hungry, try their pork soup. On what felt like a summery September day, we headed over to Lifted Spirits to enjoy a cocktail (or two…maybe three). What you’ll notice immediately is the space—the tasting room and bar, which opens up to the distilling area—which is the perfect mix of farmhouse and rustic-hip, making the space feel warm and friendly. The second thing that will blow you away is the cocktails (you guys, the cocktails here!). While it’s hard to choose just one drink since they offer just about everything, we love the informational menu that showcases their knowledge and passion for their spirit magic. Bonus points for the little icons that show us what kind of vessel the drinks will be offered in. We recommend: You can’t go wrong with a gin & tonic here (Lifted Spirit gin makes gin haters into lovers), but if you’re feeling adventurous and enjoy a little kick in your drink, try the Wild East. It comes with a lil slice of jalapeño! PS - If you’re lucky, the house distillery dog, Princess, will welcome you in and sit by your feet as you order at the bar. As you’re walking down McGee Street, you may walk right past The Brick without even realizing it. The entrance to the place is very unassuming, surrounded by some plants and a sandwich board listing the day’s specials. But once you’re inside, it’s hard to forget. Something about the combination of year-round Christmas lights, old school Boulevard Beer-branded ceiling tiles and the changing art on the walls makes this place cozy and unique. We’ve been here for lunch a number of times (and brunch too – their food is really solid overall), but this day we chose happy hour. OK, maybe some tots too. If cocktails are your thing, they have some really great no-frills options including a spicy margarita and one named A Hug from Ryan Gosling. But they have a lot of beer options too and Boulevard Wheat specials during happy hour. What also makes The Brick special, aside from the good snacks and friendly service, is the people watching. From business people out for a quick lunch to art lovers winding down with a cold one, everyone is welcome here. And everyone should go. We recommend: Whichever beer or cocktail tickles your fancy, but definitely get the tots. So. Good.